Biomanufacturers are striving for leaner and more flexible processing, and it’s paying off. Reports received at BPI are showing that companies are improving the efficiency and robustness of their processes, and some are making changes in facility and process designs. Multiproduct, closed-system, and “portable” manufacturing facilities are helping manufacturers meet capacity demands. And additional competition from biosimilars makers has pushed some companies toward further expanding their commercial market as their original biologics come off patent. Contract manufacturing in general is growing, thereby allowing some biomanufacturers to focus on more innovations. That trend is driving emphasis on good technology transfer and the criticality of selecting a “right- fit” contract manufacturing organization (CMO), as presented in the discussions below. But challenges remain. Risk management requires considering the entire life cycle of a drug product. And the developability and manufacturability of a drug candidate must be determined early on. Supply chain management is essential, especially for on-demand processes. Strategies for raw material traceability and control involves balancing cost with risk while keeping patient safety as the primary objective and an eye on compliance with stringent regulations. Manufacturing tools include increased implementation of automation, process control, enterprise-level software, process simulation software, and facility modeling. How these all will play a role as the industry considers alternative process designs such as continuous manufacturing and accelerated production at different scales remains to be seen. BioProcess International spoke with selected conference presenters who will address some of the major issues in manufacturing strategy. Please visit the website listed at the end of the article for their complete podcasts of other presenters not featured here. Abstract: Risk management is most effective when used prospectively during product development and process design and when design and control systems are easily modified to reduce risk and improve product quality. 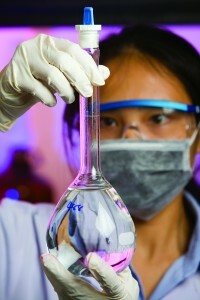 Building quality into drug-product manufacturing processes up front is better than testing products for defects later. The use of risk management to design, qualify, and operate systems used in manufacturing processes is beneficial. Would you briefly describe the life- cycle approach to risk management for biopharmaceutical products? The risk- management process is typically initiated no later than the defined phase of a system qualification/lifecycle. Risk assessment and risk management are used to focus design and specification development efforts. Early planning facilitates appropriate data gathering from stage 1 (process design), in which a quality risk assessment is performed subsequent to initially identifying critical quality attributes (CQAs) and defining a manufacturing process and associated critical process parameters (CPPs). As the life cycle of a product continues, quality risk management (QRM) is integrated into the pharmaceutical quality system (e.g., validation, change control, deviation management, annual product reviews, and audits). How does that approach work with quality by design (QbD)? When introduced in the QbD space, QRM allows movement within a design space. QRM can be used to characterize a process because it provides a holistic review of the ways in which equipment, for example, enables the CPPs. That in turn assures product-quality attributes. ICH Q9 (QRM), Q8 (pharmaceutical development), and Q10 (pharmaceutical quality system) guidelines provide assistance for manufacturers implementing QbD into their operations. For companies considering such an approach, what departments or groups should be involved on the front end? It is highly recommended that cross- functional teams representing the entire organization’s interests participate in risk-management activities to enable more broad communication, gain alignment more easily, and build better outcomes. Using a cross-functional team of employees who are intimately familiar with the process, system, and product being risk assessed greatly increases the value of the process. Such teams can shed light on how risks and objectives are correlated and how business units are affected differently. Before initiating risk- management activities, it is imperative to obtain sponsorship from senior leadership, especially when projects require dedicated resource allocation. The deliverable of a risk assessment often consists of several proposed projects that may require capital funding or extensive resource allocation. A sponsor must be at a level to be responsible for such decisions and to understand the importance and impact of risk management activities. Therefore, the sponsor has the authority to dedicate the required resources for the needed time to complete activities. In addition, a qualified and unbiased facilitator is integral to the success of risk management activies. That facilitator must act as an independent QRM expert to oversee the execution of the risk management process and facilitate risk assessment sessions. What tools can help? Multiple informal and formal risk-assessment tools can be used. Such standard tools are listed in the ICH Q9 guideline. Several companies have invested in enterprise- level software and knowledge- management databases to store and manage risk assessments. Those tools can assist in documenting all phases of risk management, including mitigation plans and risk communication outputs to management. They facilitate a more efficient risk-management process by shortening the time it takes to conduct risk assessments and provide risk visibility in a central knowledge base for risk management. They also help with integrating risk management into all key organizational processes by incorporating it into day-to-day operations and decision making, which reduces risk and drives performance. Aside from speaking, why are you attending the BPI Conference? The BPI Conference provides an opportunity to network in the industry and share learning and best practices. It offers an extensive exhibition where I can keep up with new technology. I can share my learnings with my colleagues and learn from them specifically when it comes to QRM implementation. Abstract: The biopharmaceutical industry is developing increasingly stringent demands on the quality and consistency of raw materials used in manufacturing. To manage this complexity, many large pharmaceutical organizations are creating strategic supplier relationship programs to focus their development activities. This presentation will discuss strategies to manage a strategic supplier innovation pipeline that preserves the freedom to operate for both organizations and creates valuable solutions that can be broadly disseminated across the industry. What is a strategic supplier program and why it is necessary for some companies? A Strategic Supplier program is essentially a select group of your suppliers for a strategic management program. Those suppliers are typically fairly critical to your manufacturing process, either because the raw materials that they supply are very unique or because of the amount of business that you do with them. By this, I mean that you have more interactions with those suppliers at a strategic level rather than a more tactical or transactional suppliers. A tactical or transactional supplier might be someone who would issue a purchase order (PO) when you need a product or raw material. And you deal with potential issues with their products as they arrive. With a strategic supplier, you probably do more forecasting. You would work more with that supplier to compare its capacity with your forecast, and you would have a more proactive program in the areas of quality management, supply chain management, and technical development or innovation between the two organizations. Typically a company will have a portfolio of strategic suppliers, and they can represent a number of raw material categories for the manufacturing site. It can be upstream raw materials, downstream filters, chromatography resins, or single-use systems. The reason why a lot of biopharmaceutical companies are now heading in this direction is that their understanding and appreciation of the criticality of raw materials to manufacturing processes and the potential variability that they can impart on those processes. Manufacturing variability is a function both of process variability and raw material variability. Raw material variability has been more often characterized. So we understand more about how raw materials can affect our manufacturing processes. Through innovative technical partnerships with our suppliers to help understand critical quality control points within their processes, we can create solutions to help minimize total variability in our manufacturing processes. Really, it is ultimately driven toward patient safety and supply-chain continuity. How and where should a strategic supplier program be structured within a biomanufacturing organization? Typically, a strategic supplier program starts off within the strategic sourcing department. But then there is obviously going to be strong influence from the quality organization because often some issues with raw materials become quality investigations. Then technical organizations get involved. Typically operations technology or manufacturing science support the commercial processes that an organization operates. Some innovation will also be codeveloped within the process development organization. So although the program is owned by strategic sourcing, typically several other groups within the organization feed into it. As you look at innovation in particular, typically that’s either process development or manufacturing science that helps organize that pillar of the relationship with regard to technical innovation between the organizations. And there is a parallel for that at the supplier side. Typically the R&D department will collaborate directly with the manufacturing science or the technical organization at a pharmaceutical company. Likewise, a commercial organization would work more with the strategic sourcing functions within the pharmaceutical company. Aside from speaking, why are you attending the BPI Conference? The BPI Conference is an excellent opportunity to make contacts with other peers in the industry, understand their issues, and discuss some of the ways that they’ve been able to reach resolutions. It’s also an excellent way to engage a number of suppliers to create the partnerships that you need to identify new ideas in the industry, share those ideas, and improve the understanding of trends in the industry. Abstract: Following the well- received publication of the BioPhorum Operation Group’s (BPOG) CPV Case Study, the BPOG CPV team has created a “playbook” or step-by-step guide to the implementation of CPV in table form. The guide aligns with the FDA’s product life-cycle model and refers to a flow diagram. The aim is to make implementing CPV an activity that is accessible to everyone in the biopharmaceutical operations environment. This presentation will describe the playbook and how to access and use it. Would you briefly describe the CPV Playbook? The CPV Playbook is an effort that was coordinated and written by the BPOG, a collection of company representatives who collaborate on topics that are important to the companies. Continued process verification is one of those topics. The intended audience for this discussion is biologics and biopharmaceutical companies that are interested in implementing CPV based on FDA and other regulatory agency guidances. It is based on a desire to keep up with good manufacturing processes. This is a chance to hear from a collection of companies that have collaborated to discuss how they are implementing and how they view continued process verification. You mentioned a CPV case study that was published by BPOG. How does that differ from the condensed playbook that you will be presenting at the BPI conference? The CPV paper that was previously published by this same group is very extensive work. It has a lot of examples. It uses as a basis the A-Mab case study that was published several years back to provide an example of a CPV implementation. It is useful as a case study in the industry, but we felt as a group that something that is more condensed (which is why we called it a “condensed playbook”) and more step-by-step might be more useful for companies as they collaborate internally or with contract manufacturing organizations (CMOs) and others. It would form a sort of shorthand version of how to do CPV. And it might be a useful tool to summarize and encapsulate the similar information that is included in the much larger case study that was published previously. In your abstract, you mention that the guide aligns with the FDA’s product life-cycle model. Would you describe how BPOG approached that and why? The FDA outlined a model for process validation that includes three general stages: the development stage, the process qualification stage, and the continued process verification stage. In the condensed playbook, we’ve tried to provide examples of actions that are performed and how they align to those stages. For instance, this action should occur at the end of stage 2 as you are ready to enter stage 3, which is the commercial production stage or continued process verification stage. And then these other actions all take place within stage 3. We’ve tried to align the guide with what we feel is a reasonable interpretation of FDA’s guidances so that it could be discussed potentially with the FDA and with other companies. The goal is to come to a agreeable interpretation of how this guidance applies industry. What did you learn as a result of putting these publications together? We learned a lot about the commonalities among the companies’ approaches to implementing continuous process verification. We learned that there are many common problems. For example, we discussed issues with data aggregation and availability and the challenges associated with legacy products. But we also learned about some differences in the specifics of how companies are defining and implementing CPV elements. They may be using different ways of documenting their actions or using different rules to govern what is considered a flag or a statistical alert event, for instance. So there is definitely more to learn about where there might be flexibility. Companies need to define for themselves how they want to approach it and what scope they want to take. By contrast, there are some points that the industry agrees on fairly well, and there is a consensus that CPV at least consists of the things mentioned above. Aside from speaking, why are you attending the BPI Conference? I’m attending to get greater exposure for the BPOG group, myself, and my company to interact with other people who might be thinking along the same lines and interested in the same problems. It’s an opportunity to do all of those things. Abstract: Deciding on a strategy for making your first biologic can be a daunting process. For small biotechnology companies with limited financial and personnel resources, identifying CMOs that have the right capabilities, cultural fit, and flexible environment is an important part of getting past that first IND phase 1 milestone. Larger biopharmaceutical companies have different criteria for choosing a CMO. This talk will present case studies and factors that help accelerate drugs through clinical milestones and discuss how CMOs can be a significant resource. How does using a CMO to scale up products for phase 1 trials help smaller biopharmaceutical companies? CMOs have so much broad experience with so many different cell lines and types of product that they can triangulate onto the best early-stage process development program for a small company that may not have that level of internal expertise. A good CMO applies a huge knowledge base to each program. In phase 1, you want to get your product to the point where it’s got the characteristics that you want it to have so that as you scale it up, it maintains its integrity and quality attributes as a manufactured product. What areas are most important to make sure that companies have the right fit for their needs in looking for a CMO? A number of different areas are important to small companies. Right fit often comes down to a combination of capability and personality or cultural fit. There is the technical piece, but there is also the “soft stuff” — the relationships and communication-level needs of a client. It’s somewhat different. It tends to be more personal. Having a good cultural fit so that the level of communication and understanding are easily communicated is an important aspect of being a small company and getting the right fit. That usually means that there is somebody who is truly dedicated to working with you — a project manager whom you can talk to regularly who communicates well, brings in the right subject matter experts, explains things to a sponsor company, and can spend the right amount of time to help it understand why they are doing what they’re doing. The technical aspects are important, but those should be combined with personal relationships. Right fit comes down to a risk profile of making sure that you have a cultural alignment, attention to detail, a level of communication that is consultative in nature, and written communication. How does CMO selection differ between smaller and larger biopharmaceutical companies? The first element about right fit is experience in the kind of molecule that you’re making. You need that level of technical expertise from a CMO, and you should feel comfortable after leaving a conversation with a CMO. If something is not sitting right, then that should be a red flag, and you need to chase that down before you make your final choice. The right fit also depends on the size of the CMO and where it focuses its expertise. If you are a small company in phase 1, your risk of failure is very high. If you’re going to sell the drug off to another company instead of carrying it through to phase 3 commercial on your own, then you need a different strategy. That kind of information is worth understanding with a CMO because a smaller CMO is more likely to have a high degree of commitment to your program if it understands all of your criteria. Larger CMOs with a lot of commercial capacity are more interested in knowing that they are going to keep you all the way through to commercial. For the selection process, there are a list of things: the level of communication, capacity that you need, technical expertise, communication level, frequency of that communication, and the comfort that you have with that CMO even when you are going through an interview process. Some of it will show up just in the response to your request for proposal (RFP). So when you send an RFP and you ask for a response with a proposal, the level of detail that a CMO will provide you and the level of questions it asks will help define whether the criteria you are using to pick your CMO are the right criteria. The CMO selection process varies from company to company depending on the level of expertise and the size of the organization pursuing phase 1 trials. But, if we are presuming it is a small company, then typically a smaller CMO — as long as it is technically capable and experienced in the type of molecule that you’ve got — is probably going to be the best fit. Aside from speaking, why are you attending the BPI Conference? I attend the BPI conference because I always have, and it’s probably one of the best conferences that I go to annually. It is represented by very good science and very good business opportunities. A large number of people go there, so it provides a great networking opportunity. It’s just been one of the better conferences that I usually attend. Ever since the first conference, I’ve been going. It’s been a marvelous event to attend, and I’ll continue to do that. Berner I, Dexter S, Galiher P. Global Evolution of Biomanufacturing. March 2013. Sargent, B. Biologics Have a Robust Pipeline. June 2013. Curran P, et al. Container–Closure Integrity. October 2013. Gupta D, Prashanth GN, Lodha S. A CMO Perspective on Quality Challenges for Biopharmaceuticals. October 2013. Moncaubeig, F. Simpler and More Efficient Viral Vaccine Manufacturing. October 2013. Wisher M. Virus Risk Mitigation for Raw Materials. October 2013. Farid S. Cost-Effectiveness and Robustness Evaluation for Biomanufacturing. December 2013. Rader RA, Langer ES. Bioprocess Advances Drive Vaccine Manufacturing in Developing Countries. February 2014. Whitford, W. Single-Use, Continuous Processing of Primary Stem Cells. March 2014. Calcott PH. Managing Contract Relationships with Quality Agreements: Keeping in Mind the New FDA Guidance. June 2014. Quilligan A. Managing Collaboration Across the Extended Organization. June 2014. Peyrache S, Nagy A. Build, Buy . . . or “Rent” Capacity? A New GMP Biomanufacturing Business Model. December 2014. Bird P, Hutchinson N. Automaton of a Single-Use Final Bulk Filtration Step: Enhancing Operational Flexibility and Facilitating Compliant, Right-First-Time Manufacturing. March 2015. Blomberg, M. The New Hybrid: Single-Use Systems Enabled by Process Automation. March 2015. Dennet, R. Modern Technology Transfer Strategies for Biopharmaceutical Companies. March 2015. Pueker, T, Monge M. Implementing Flexible, Scalable, and Cost-Efficient BioProcess Platforms: A Proven Project Management Approach. March 2015. Brandwein H. Accelerating Affordable Growth: Careful Planning Can Pave the Way for Commercial-Scale Manufacturing. April 2015. Cappia J-M, et al. Enhanced Assurance of Supply for Single-Use Bags: Based on Material Science, Quality by Design, and Partnership wit Suppliers. September 2014. Jain S. When is a Virtual Business Model Suitable for Biopharmaceutical Companies? April 2015. Restaino LG, Restaino B. Outsourced Data Integrity: Are Short-Term Financial Gains Worth the Long-Term Headaches? April 2015. Breit J, et al. A Multidisciplinary Approach to Manufacturing Biotherapeutics. March 2015.